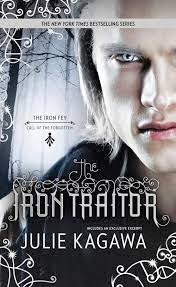 There are several reasons why I enjoyed The Iron Traitor more than The Lost Prince. It’s darker, more suspenseful, and has better characterisations than TLP. My biggest concern however was that the title was a dead giveaway and I suspect that Kagawa (or her publishers) did that on purpose to tease us. Either way, I think that the journey was more important than the ending. What is interesting about this sequel is that for once, it’s not really bad things happening to even. Of course that doesn’t mean it doesn’t affect him, we wouldn’t have a book. Annwyl is dying and Kierran seeks to find a way to stop her from Fading.As Kierran’s best friend and uncle, Ethan finds himself getting sucked into the world of fey once more to help a family member in stop all the while, Kenzie, his girlfriend, is dying from leukaemia. But with an eerie prophecy hanging over his head, Ethan fears the worst of Kierran. Overall, I enjoyed the balance of action, romance, and even a bit of mystery. And when Ethan uses his brain, he is very badass! Ethan — a.k.a. “tough guy”; “Iron Prince” (by relation to Meghan). I like him — nay — I LOVE him 🙂 Ethan has a firm sense of loyalty. Whilst he isn’t the cleverest character, he isn’t as impulsive as Kierran. Having encountered the Good Neighbours as a child (he was kidnapped by Machina, iron King) he is very cautious around the fey. As a boyfriend, Ethan can often be overbearing and overprotective, as he himself points out. This can be infuriating at times when he attempts to protect Kenzie when she claims she does not need protection, and he does do one or two things that are a bit stupid and may potentially ruin their relationship. This of course was a brilliantly thought out idea because in reality a lot of the problems are actually internal as opposed to external. This means of course that aside from the potential threat that the faeries could be, Ethan also has to worry about his relationships which are founded on trust, reliability, and of course love. On the whole, Kagawa has represented the mind of a teenage boy quite well. In this book, Ethan comes out of that broodish/thugish/mystery boy shell. The walls of his placed around him come crumbling down and it’s all thanks to Kenzie. We get to see more of the person, as he is represented in multifaceted way. Kenzie– For some time in the first book I did wonder why Ethan was interested in her but of course it became quite apparent. Kenzie is one of the few people who isn’t afraid of Ethan. She strives to find the truth about him, to break him out of his shell so that he can actually try and interact with other human beings. Of course, she gets more than she bargained with when she discovers the world of the fey in the process, but through it all, she remained strong and defiant. She continues to do the same throughout The Iron Traitor, despite other people constantly trying to protect her due to her illness. She was definitely one of my favourite characters, strangely reminding me of Annabeth Chase from the Percy Jackson series because she is smart and resourceful. I also occasionally felt sorry for her when the boys were being stupid. Kierran– I don’t even know where to start with this guy. Oh, I know. Desperate. Kierran is desperate to save the love of his life, Annwyl, from Fading. As a summer fey exile, her destiny is to Fade away into nothingness, and her encounter with the Forgotten in the previous book has speeded up the process. In a race against time, the Iron Prince seeks to find a cure, but it will come at great cost. How far is he willing to go save the one he loves? Now if you know about the Iron Prophecy already, you’ll know what’s to come and it’s all a matter of how and when. As to be expected from a Julie Kagawa book, she hit me right where it hurts at the end. So I warn you, there will be pain. But really you’ll love it. And hate it. At the same time. I rate this book… 4/5 stars!